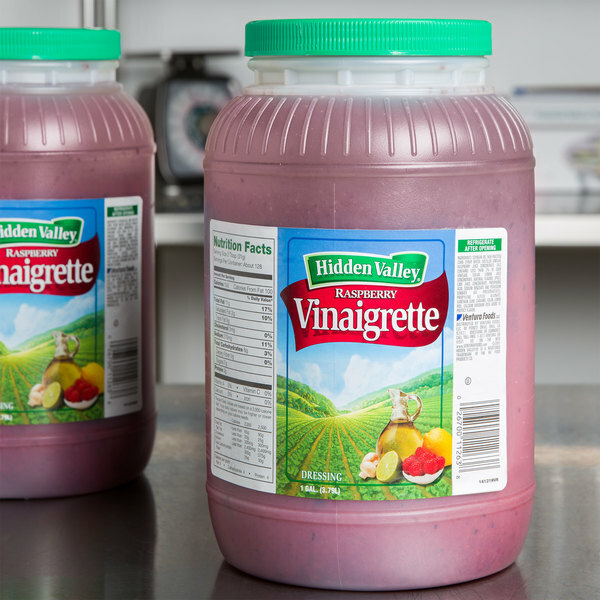 Stock up on this Hidden Valley 1 gallon raspberry vinaigrette dressing for your salad bar, restaurant, or catered event! Fresh and flavorful, it delivers just the right amount of rich, tangy taste to your customers' food. With a taste similar to balsamic vinaigrette, it enhances your dishes with its bright raspberry notes. It's perfect for serving with fresh fruit or garden salads. One light yet flavorful drizzle of raspberry vinaigrette is perfect for sprucing up flatbreads, sandwiches, and wraps. This product enhances your salads with the quality taste your customers have come to love and expect from the Hidden Valley name brand. This premium dressing is packed in a bulk gallon size with a resealable cap to keep your business in good supply. Ready to use right out of the container, this dressing has a variety of uses for your menu. Light and tangy with the added sweet/tartness of raspberries, this dressing is both visually appealing and very tasty. The one gallon container is great for back of house, but also works great in salad bars or at any large gathering. And, with Hidden Valley, you cannot go wrong. Imagine your guests' delight when they find sweet and tangy Raspberry Vinaigrette on your salad bar. The gallon size container will also work great for many individual servings in-store. And, your guests will be thrilled when they taste the quality of Hidden Valley. For customers who prefer a light and tangy flavor with their greens, Raspberry Vinaigrette is a hands-down favorite. And, this one gallon jar works well for back-of-house serving. It's also great for salad bars. 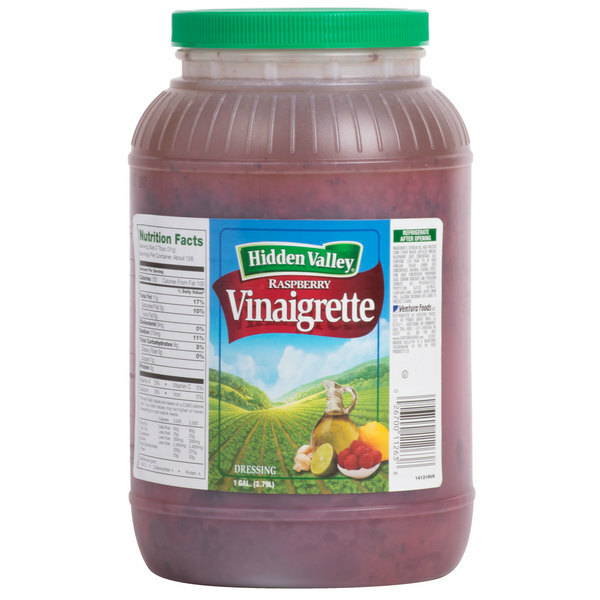 The Hidden Valley Raspberry Vinaigrette is a great tasting and a low fat dressing. This is great for marinades, salad dressing and as a topping for subs. The Hidden Valley raspberry vinaigrette is sweet and tangy. A great, light salad dressing that is perfect for using on our spinach and fresh strawberry salad.